We spent nearly a week in Cairns, mainly shopping for provisions and used books, and taking care of other chores. We managed one day of tourism to travel on the Scenic Railway to Kuranda. We fueled up and left Friday and then visited Upolu Reef and Michaelmas Cay. Now we're at the Low Islands ("Today we passed some low islands." - Captain Cook, 1770) which are near Port Douglas. All of these reefs are heavily visited. 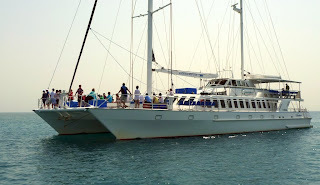 Every day large boats come out of the nearby ports loaded with snorkelers and divers. However, they are still pleasant places to anchor at with reefs to snorkel, beaches to walk on, and birds to watch. We're on our way to stop at Cooktown in a couple of days; our last opportunity to buy fresh food before our stay at Lizard Island. I have just posted Podcast #33 to my PodCastaway Feed. It covers the month between Townsville and Cairns, and includes a discussion of anchoring issues. We're at Fitzroy Island - just 15 miles from Cairns - for the second time. We came here first after a night in Mourilyan Harbour - a sugar port with little more to offer than a shallow muddy anchoring spot - and sat out a few breezy days here. Then we went back out to the reef. All the reefs - and the islands - near Cairns are regularly visited by tourist boats. We first went to Thetford Reef which typically had 5-6 dive boats visiting daily. The dive boats used a collection of private moorings in the bommie fields on the northwest side of the reef. These coral bommies rise to the surface out of 70-80 feet deep water. We had to thread our way into the lagoon to find somewhere we could anchor. Even then it took two anchors to keep us from swinging onto the coral. We spent three nights there and made three dives - from the private moorings in the bommie field, of course. Then we moved on to Milln Reef a bit further out on the outer edge of the Great Barrier Reef. This reef also is well visited and has a collection of moorings along its west side. Happily it has a public mooring too as there is virtually nowhere to anchor. We spent a night on this mooring and made three dives. These dives have been better than those we made further south; the water is becoming clearer and warmer! Now we're back at Fitzroy Island while the wind has kicked up again. Fitzroy is also visited daily by a tourist ferry. The island has a resort that, although recently built, is closed due to the developer going belly-up. 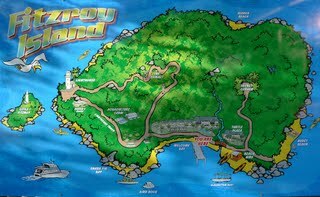 The island is a National Park and has several hiking trails and a camp ground. We're due into Cairns in a week to pick up a guest but we hope to get back to Milln Reef before we go in.